Summary: If Ruby Wright could have her way, her dad would never have met and married her stepmother Willow, her best friend George would be more than a friend, and her mom would still be alive. Ruby knows wishes can’t come true; some things just can’t be undone. Then she discovers a tree in the middle of an Ohio cornfield with a wormhole to nine alternative realities. 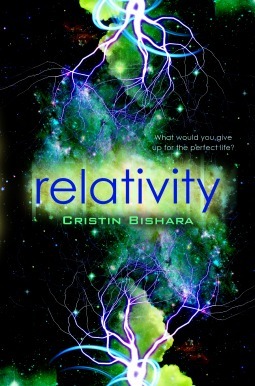 Review: Bishara has done an excellent job intertwining science and YA! There is plenty of math and string theory in this book, but you never feel bogged down with information. It’s a slightly heart-wrenching read, at least for me. Ruby is forced to move from her home and best friend, halfway across the US to live with a stepmother and stepsister (who makes it clear that she hates her). Ruby focuses on her loss. The loss of her mother at age four, the loss of her best friend (and love interest), the loss of everything she knows and loves. I’ve been there. I’m sure plenty of readers have, in some way or another. So what does Ruby do when she finds a way to jump planes of parallel universes? She searches for the perfect one, of course! Bishara keeps the focus tight, which in turn keeps the tension high. The emotional arc is beautifully done, as is the characterization. This is a short read, but I felt connected with Ruby.